If it is applied then you have to give the correct password to open the document, otherwise you cannot open the document. If it is applied then you have to give the correct password to modify the document, otherwise your document is opened but you cannot modify the document. It means that your document becomes read-only. To apply a password to document, follow these steps. * Open Save As dialog box by selecting "Save As" command from File menu. 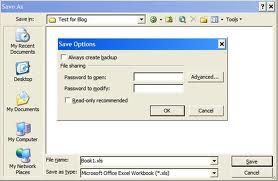 * Click "Tools" button of Save As dialog box and choose "General Options" from drop down menu, "Save" dialog box appears as shown in figure below. * Enter first password in "Password to open" text box and second password in "Password to modify" text box (if required) and click "Ok" button of dialog box. Microsoft Word will open "Confirm Password" dialog box for the confirmation of passwords. The maximum length of password is 15 characters. * Re-enter the password to open and password to modify and click "Ok" button of Confirm Password dialog boxes one by one. * Click "Save" button of Save As dialog box.